Publish Your Vacation Calendar on the Web! Publish Available Vacation Days on the Web! We sell employee vacation scheduling and attendance tracking software for business. VacationScheduler allows you to schedule vacations quickly and accurately. Process hundreds of requests in seconds. Our staffing software schedules employees by department in seniority-date order, on a first-come, first-served basis, or a combination of the two methods. Requests are added by clicking on a calendar. Typing is kept to a minimum. The Bottom Line - First! Save Time! Save Money! Reduce Frustration! Increase Productivity! Save Time! - One client reported that he saves 90 minutes a day. Another reported that he saved 30 hours in the first round of vacation scheduling. Are employees switching vacations? It is easy to make changes with VacationScheduler! Save Money! - A client reported that the Attendance Tracking module saved him $4,500 the first month he used it. Reduce Frustration! - Ever wonder what's really going on with the vacation schedule? Have to scramble to fill positions? VacationScheduler prevents under-staffing in departments and in work centers. You set the maximum number of employees who can be on vacation for each day of the year. Increase Productivity! - When scheduling by hand, errors can easily creep into the staff scheduling process. Our vacation scheduler prevents those errors. Accurately schedule your employee's vacations. Regain Control! - Bring organization to the vacation scheduling process. Print or view vacation reports on screen. The vacation calendar, available vacation days, and other reports can be printed by department and work center. Over 50 reports help you track what is happening. Don't be surprised by an end-of-year scheduling frenzy! You will know what is happening and be able to encourage people to schedule their vacations. Employee vacation scheduling is a unique staff planning problem that can be tamed with our vacation scheduling software. VacationScheduler can be an important addition to your quiver of HRIS tools. 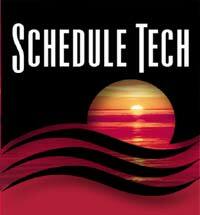 E-mail info@scheduletech.com for a free Demo CD that will give you an extensive look at our human resource software. Use the links above and to the left to explore our web site or use our site map. Copyright © 2010 Schedule Tech. All Rights Reserved. Copyright © 1998 Comstock Photos. Figure Copyright © 2004 Creatas.